To Make The Body Beautiful - Body Piercing Jewelry and more... ! We want you as a customer to have 100% satisfaction for the jewelry that you order from us. But since Body Jewelry is a personal item and for health reasons, we cannot exchange, make refunds. So in other words, "NO RETURNS". Note: This is for a single PIECE! If you want a pair you must order two. - Prices are subject to change. Delicate rose shape. Intricate details such as rose petals are visible. These Plugs are made using Dental Acrylic. Plugs are 2 G 1/2" long Available in: 7/8" $6.99 ea. These Plugs are made using Dental Acrylic. Plugs are 1/2" long total, 3/8" wearable between grooves. Plugs come with Double Black "O" Rings to hold the plug in place. Available in: 7/8" $14.99 ea. Available in: 1" $14.99 ea. Black, Clear, Blue, Green or Red. This Silicone Eyelet is manufactured from soft flesh colour Silicone. The eyelet is completely flexible and very easy to fit as you simply just pop it into the piercing. Silicone eyelets are amazingly comfortable and light weight to wear with a double flare for a secure fit. Available in: 6G, 4G, 2 G, 0G,00G, 7/16" 1/2", 9/16", 5/8"
Available in: 7/8" and 1"
These Double Flare Plugs are made using Pyrex glass that has been layered with titanium and other metals, producing brilliant sparkling colors. 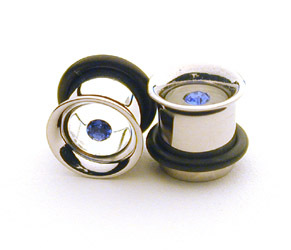 Backed with a rich cobalt blue, these plugs are equally beautiful when worn reversed. - All gauges are 3/8" between the flares. Plugs made by Industrial Strength. These Pyrex Plugs have a flare on each end so no o-rings are required to hold them in place. Phalo Blue or Lavender Seed. Dome Plugs are 2G on the inside and 0G on the Dome. Available in: 2G Pink Sparkle. - Backed with a rich Cobal Blue, these plugs are equally beautiful when worn reversed. Plugs made by Industrial Strength. Available in: 2G Purple Sparkle. - Backed with a rich Cobal Blue, these plugs are equally beautiful when worn reversed. Plugs made by Industrial Strength. Available in: 0G Light Blue and Rainbow. - Backed with a rich Cobal Blue, these plugs are equally beautiful when worn reversed. Plugs made by Industrial Strength. Available in: 0G Rainbow Sparkle. - Backed with a rich Cobal Blue, these plugs are equally beautiful when worn reversed. Dome Plugs are 0G on the inside and 00G on the Dome and 1/2" long. These 00G Double Flare Plugs are made using Pyrex glass that has been layered with titanium and other metals, producing brilliant sparkling colors. Backed with a rich cobalt blue, these plugs are equally beautiful when worn reversed. - All gauges are 3/8" between the flares. These Pyrex Plugs have a flare on each end so no o-rings are required to hold them in place. Plugs made by Industrial Strength. These 7/16" Double Flare Plugs are made using Pyrex glass that has been layered with titanium and other metals, producing brilliant sparkling colors. Backed with a rich cobalt blue, these plugs are equally beautiful when worn reversed. - All gauges are 3/8" between the flares. These 7/16" Double Flare Plugs are made using Pyrex glass that has been layered with titanium and other metals, producing brilliant sparkling colors. Backed with a rich Black, these plugs are equally beautiful when worn reversed. - All gauges are 3/8" between the flares. Clear Double Flare 2G. - Backed with a rich sparkling Lt. Pink, these plugs are equally beautiful when worn reversed. - All gauges are 3/8" between the flares. Plugs made by Industrial Strength. Clear Double Flare 0G. - Backed with a rich sparkling Lt. Pink, these plugs are equally beautiful when worn reversed. - All gauges are 3/8" between the flares. Clear Double Flare 5/8'. - Backed with a rich sparkling Ocean Sparkle Iridescent color, these plugs are equally beautiful when worn reversed. - All gauges are 3/8" between the flares. 7/8" Clear Double Flare. - Backed with a rich Black color, these plugs are equally beautiful when worn reversed. 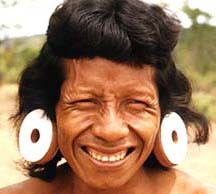 - All gauges are 3/8" between the flares. 1" Clear Double Flare. - Backed with a rich Blood Red color, these plugs are equally beautiful when worn reversed. - All gauges are 3/8" between the flares. Can be used in the conch or ear lobe. Available in: 0G with center stone in: Clear, Red and Lt. Blue. *Note Double Flare Earlet/Eyelet are always one size larger on the outside. Available in: 1/2" with center stone in: Lt. Blue. Available in: 0G with center stone in: Dark Blue and Lt. Blue. Available in: 1/2" with center stone in: Clear. Available in: 0-G and 00-Gauge. Silver Eyelets--Double flare --Iron Cross, Star Shape. Single Flare Eyelet with (clear O ring) and clear inner acrylic and a CLEAR not BLUE Rhinestone in the middle. Engraved Symbol--Hallow Stainless Steel Plugs --w/double black "O" Rings. 2G and 7/16" in Length. $30.00 ea. "Fractal" Eyelets by Good Art FRACTAL Eyelets-- These natural titanium eyelets are part of the Good Art Fractal Creations line. If you're bored with your eyelets and are looking for something wild, you need some of these light-weight titanium eyelets. Click image to see item details "DEMON" THROAT--Made from cast titanium, these custom eyelets are available only in natural titanium color no anodized. Only in 5/8" - $69.99 ea. These claws are made from 316LVM ASTM F-138 implant grade stainless steel and includes one o-ring. These Talons are made from 316LVM ASTM F-138 implant grade stainless steel and includes one o-ring. 8G (3/4" Long) $45.00 ea. 6G (1" Long) $50.00 ea. 4G (1" Long) $55.00 ea. These tribal ear spikes design by Custom Steel, are made from 316LVM ASTM F-138 implant grade stainless steel and includes two o-ring. They are approx. 2" Long. "ScrewBall" Captive Ring ScrewBall Captive Earring-- The look of a Ring and the convenience of a barbell. "Flat Tip" Captive Ring Flat Tip Captive Earring-- These unique rings are hand-made in the USA by Custom Steel. - They are made from 316LVM ASTM F-138 stainless steel. All of these rings are hand-polished to a mirror finish. All prices are per piece, not per pair. "Tapered" Captive Ring Tapered Captive Ring-- The look of a Ring and the style of a Circular Barbell. These tapered Captives are made from 316LVM ASTM F-138 stainless steel. A Cobalt Blue Titanium Ball Makes it totally unisex . $69.99 . All prices are per piece, not per pair. "Fractal Spinal" Captive/Circular Ring FRACTAL Cast Titanium Spinal Circular Earring-- This cast titanium spiral ring is part of the Good Art Fractal Creations line. They do look like spinal vertebrae sideways. All prices are per piece, not per pair. "Fractal Spinal" Captive Ring by Good Art FRACTAL Spinal Captive Earring-- This cast titanium spiral ring is part of the Good Art Fractal Creations line. If you're bored with your ear rings and are looking for something wild, you need some of these light-weight titanium rings. They do look like spinal vertebrae sideways and come with a matching captive bead.